The Samsung PM981 set new records for burst sequential read performance, but the Samsung 970 EVO fails to live up to that standard. 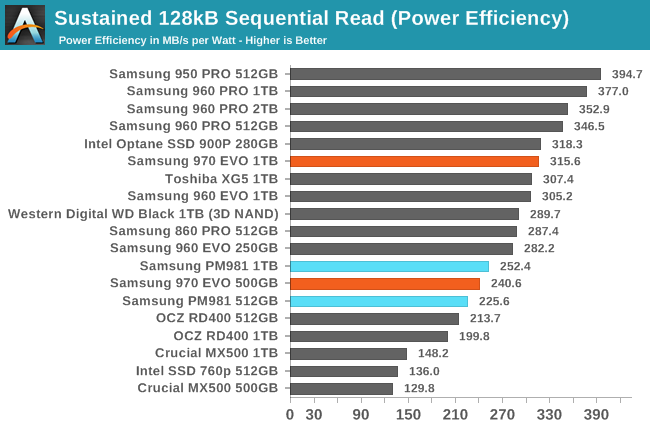 The 970 EVO is a substantial improvement over the 960 EVO, but doesn't manage to beat the last generation's fastest MLC drives. 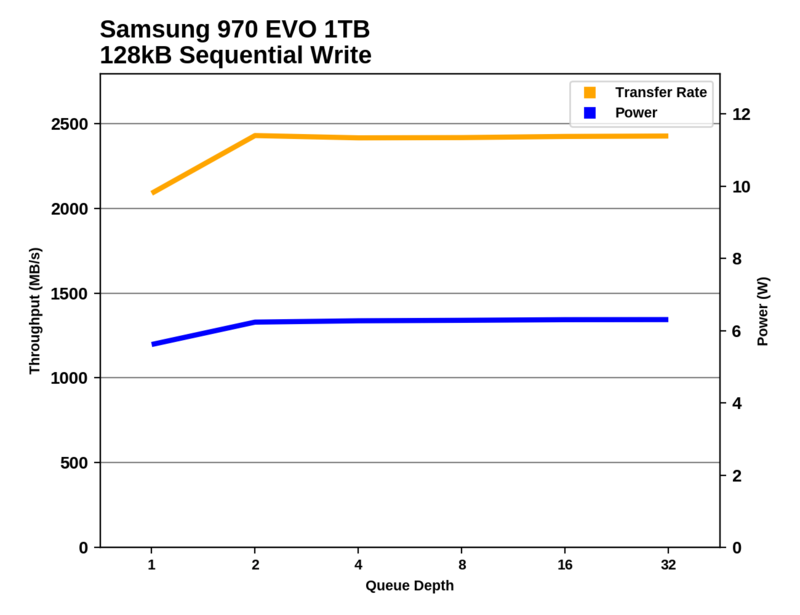 On the longer sequential read test, the Samsung 970 EVO performs far better than the Samsung PM981, indicating that Samsung has made significant firmware tweaks to improve how the drive handles the internal fragmentation left over from running the random I/O tests. The 970 EVO is the fastest TLC-based drive on this test, and the 1TB model even manages to beat the MLC-based 1TB 960 PRO. 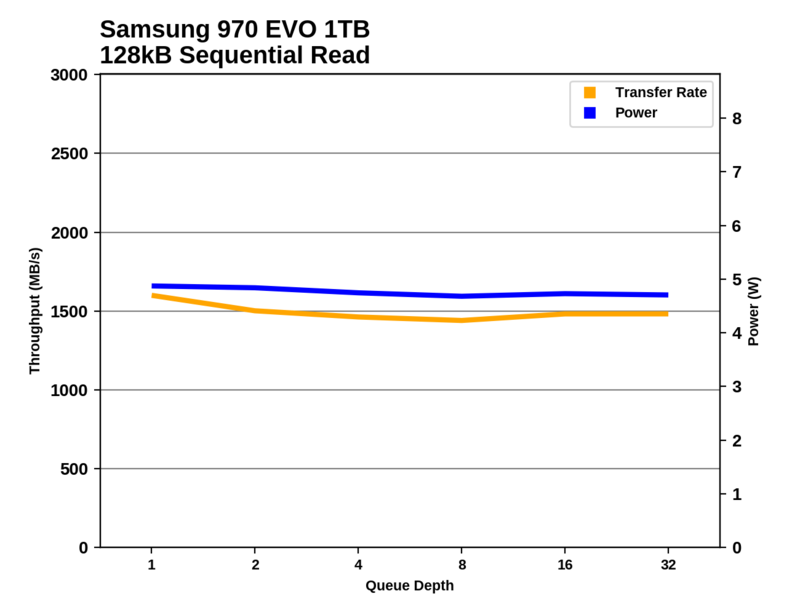 The 1TB 970 EVO draws more power during this sequential read test than any other M.2 drive in this mix, but its performance is high enough to leave it with a good efficiency score. The 500GB 970 EVO ends up with below-average efficiency. Both capacities of the Samsung 970 EVO have very steady performance and power consumption across the duration of the sequential read test. This is in contrast to drives like the WD Black and Toshiba XG5 that don't reach full performance until the queue depths are rather high. 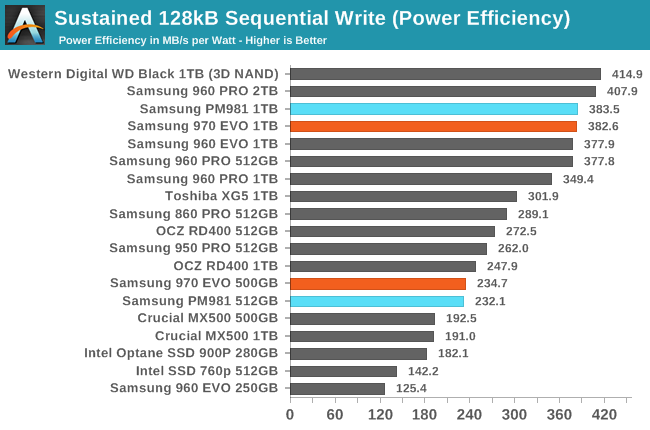 The burst sequential write performance of the Samsung 970 EVO tops the charts, with the 500GB model almost reaching 2.5GB/s where the last generation of drives couldn't hit 2GB/s. The WD Black is only slightly behind the 970 EVO. 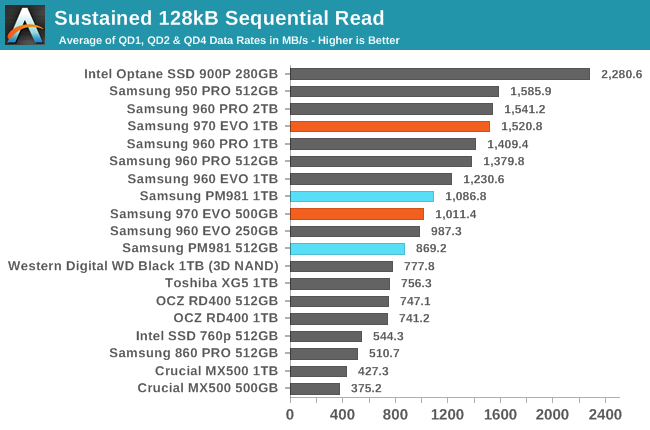 On the longer sequential write test, the 1TB 970 EVO takes a clear lead over everything else, even the 1TB PM981. The 500GB model is handicapped by its smaller capacity and smaller SLC cache, but still manages to be significantly faster than the 512GB PM981. 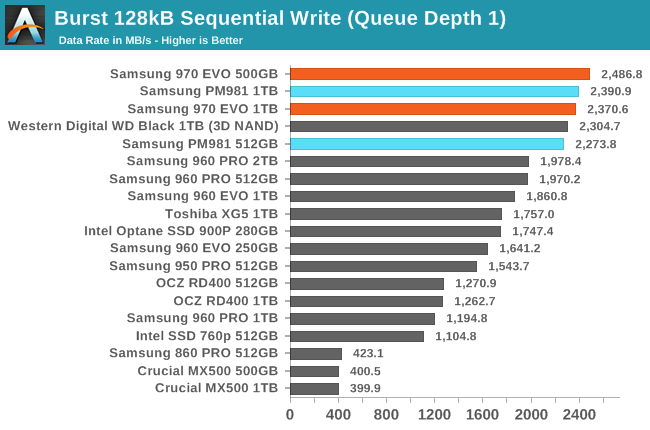 The 970 EVO and PM981 offer almost exactly the same power efficiency on the sequential write test. The 1TB model is slightly less efficient than the WD Black and 960 PRO, while the 500GB model is well behind the MLC-based drives of similar capacity. 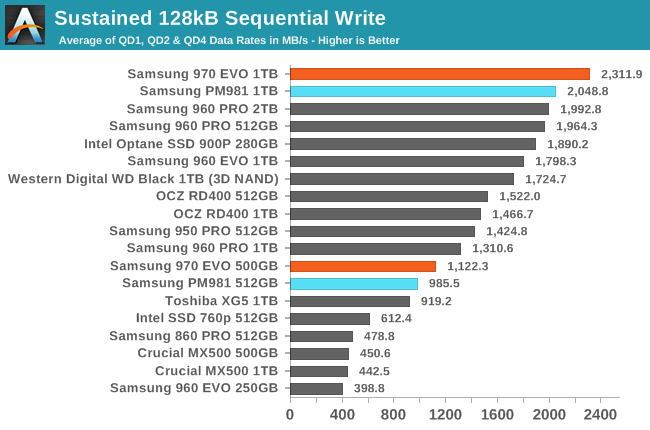 The 1TB 970 EVO starts off with a much higher QD1 performance on the sequential write test than the PM981 offers, and at higher queue depths it maintains a slight lead. At 500GB, the 970 EVO's performance oscillates as only some portions of the test are hitting the SLC cache. Samsung 970 EVO (NVMe PCIe x4) $600. Sams prices obviously need to CRASH before they make any sense. WD Black 512GB NVMe had regularly sold for $150 on sale. Until the Samsung price drops in May, the EVO 970 500GB never sold under $200, and was regularely $220-$230.